A son, Edward, was born to King Alfred of Wessex and his wife Ealhswith of Mercia. Edward’s sister, Aethelgifu was born to King Alfred and Ealhswith. A Viking force attacked Wessex and took Wareham (Dorset). Alfred lay siege to Wareham but a new Viking force of around 120 ships was seen off the coast meaning success was unlikely. Alfred made a deal with Guthrum, leader of the Vikings and exchanged hostages in return for peace. But Guthrum did not keep the deal, he killed his Saxon hostages and moved to Exeter, leaving the Viking ships at Wareham. A freak storm destroyed a large number of Guthrum’s ships giving Alfred the chance to leave Wareham and march to Exeter. Edward’s sister, Aelfthryth, was born to Alfred and Ealhswith. Guthrum returned with a large force and marched on Chippenham. Guthrum killed many of the town’s inhabitants. It is likely that this was the last straw for the Witan and that Alfred lost their support due to the fact that his attempts to pay off the Vikings had not worked. Alfred was forced to leave Wessex in fear for his life. He sought refuge in the Somerset marshes at Athelney. Alfred burnt the cakes legend stems from this period. The legend states that Alfred was taken in and given shelter by a woman who did not recognise him. She asked him to watch some cakes for her but he was so taken up with his thoughts about how to defeat the Vikings that the cakes were burnt. A large Viking force led by Ubba approached Contisbury Hill in North Devon where Earldorman Odda and his fyrd were inside the fort. Odda and his men surprised the Vikings by breaking out of the fort and attacking. The Vikings suffered heavy losses and Ubba was killed. Alfred rode to the muster point where main Wessex fyrds had mustered giving Alfred a force of around 4,000 men. Odda and the Devon fyrd were absent probably due to losses incurred by the recent battle against Ubba. As per the treaty agreed between Alfred and Guthrum, the Viking leader and around 30 chief Vikings were baptised. Guthrum, who had been baptised Aethelstan, moved his people to Mercia. Alfred began fortifying a number of prominent towns to make any future Viking attack more difficult. Wessex was covered with a network of public strongholds, several of which have a regular grid of streets that can still be seen today. Examples are Winchester, Chichester and Wareham. He also organised a local defence system. Alfred also spent time and money building ships to match those of the Vikings. Another band of Vikings arrived in England. They sailed up the Thames and Alfred was concerned that they would join with Guthrum and mount a new attack. However, after a short while they left England and sailed to France. Edward’s brother, Aethelweard, was born to Alfred and Ealhswith. A band of Vikings arrived and attacked Rochester in Kent. The town had been fortified by Alfred in 878 and was able to hold out until Alfred arrived with the army and defeated the Vikings. Alfred began putting in place measures to ensure his own son, Edward, succeeded him rather than his nephews Aethelhelm and Aethelwold. Alfred claimed to have the support of the Witan for his son to succeed him. Alfred captured London. However, as London was in the Kingdom of Mercia, Alfred, put the city in the control of Ealdorman Aethelred of Mercia. Edward’s elder sister, Aethelflaed , married Aethelred, Ealdorman of Mercia. The marriage was made so that Alfred could have some control over Mercia and London. Aethelflaed and Aethelred fortified Worcester, the first of many fortified burhs that they would construct. Guthrum, who had ruled East Anglia as King Aethelstan, died. The peace he had agreed with Alfred was honoured by his successor. Alfred established a permanent army setting up a system where only half the army was to be on service at any one time. Those not on service could be called on as reinforcements in times of need. Aethelflaed and Aethelred founded the Priory of St Oswald in Gloucester. The date is disputed. A large Danish Viking contingent arrived in around 250 ships. They landed in Kent and a number of them took over a half completed fortified building in Appledore. At the same time another Viking force of 80 ships landed in northern Kent and made camp at Milton. Alfred stationed his army midway between the two. Edward led a successful campaign against the Vikings at Farnham. Alfred entered into negotiations with Hasteinn, leader of the Viking force at Milton. A settlement was reached whereby Alfred gave Hasteinn money and treasures while Hasteinn gave Alfred hostages and swore an oath of peace. Soon after swearing a peace oath Hasteinn took his army and laid waste to Benfleet in Essex. Edward married (or had a liaison with) Ecgwynn. Historians are divided on whether Edward and Ecgwynn were lawfully married. While Alfred had been busy trying to make peace with Hasteinn, the Appledore Vikings had raided towns in Hampshire and Berkshire. They were returning to Appledore with their booty but Edward, who had recovered the stolen treasure, cut them off and put them to flight. He then pursued the Vikings, caught up with them and held them under siege on an island in the River Colne. While Edward and his father had been occupied with the Vikings in Kent, the East Anglia Vikings had sailed to Exeter and lay siege to the city. Alfred had intended to help his son defeat the Vikings on the island but had to divert and go to Exeter and lay siege to the city. A further group of Vikings marched west probably to relieve the siege of Exeter but they were met at Buttington by a large force led by the Ealdormen of Mercia, Somerset and Wiltshire who succeeded in putting them to flight and the Vikings returned to East Anglia. Soon afterwards the Vikings in Exeter withdrew and also returned to East Anglia. The Vikings built a new fort about 20 miles north of London by the river Lea. A son, Aethelstan, was born to Edward and Ecgwynn. Historians are divided on the subject of whether or not Aethelstan was illegitimate. Alfred led an attack on the Viking fortress by the river Lea but was beaten back. Alfred built two new fortresses by the river Lea which meant that the Viking force further up the river were unable to get their boats out to sea. On learning of Alfred’s actions the Vikings abandoned their boats on the river Lea and marched overland to Bridgenorth on the river Severn where they built a new fort. A daughter was born to Ecgwynn and Edward. Her name is not known. The Vikings gave up their raids on English towns and returned to East Anglia and Northumbria. King Alfred died. 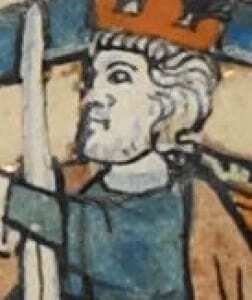 Edward, known as Edward The Elder, became King of the Angles and Saxons. Edward’s cousin, Aethelwold rose up against Edward, challenging him for the throne, and took Wimborne in Dorset, the place where is father, King Aethelred, was buried. He then took Christchurch in Sussex. Edward marched to Badbury and offered Aethelwold the chance for battle. However, Aethelwold took the decision not to fight but instead rode north. Aethelwold was made King of York and received the allegiance of the Northern Vikings. A daughter, Eadgifu, was born to Edward and his wife Aelfflaed. Edward’s sister, Aethelflaed, gave a group of Norsemen led by Ingimund, that had been expelled from Dublin, permission to settle in the Wirral. Edward was defeated in this battle with the forces of Aethelwold and his allies. However, during the battle Aethelwold and the Danish King of East Anglia Eohric were killed leaving Edward’s place as King secure. A son Aelfweard, was born to Edward and his wife Aelfflaed. A son, Edwin, was born to Aelfflaed and Edward. This date has been estimated with the knowledge that Edwin was younger than his brother, Aelfweard. Edward made peace with the East Anglian and Northumbrian Danes. It is likely that Edward made some kind of payment in exchange for peace. Edward’s sister Aethelflaed and her husband Aethelred fortified the town of Chester. This gave them control of the lower Dee and also a fortified, protected Burh to use as base from which to harry the Northumbrian Danes. Edward’s forces made a number of successful raids into Northumbria. A daughter Eadgyth was born to Edward and Aelfflaed. A daughter Eadhild was born to Edward and Aelfflaed. Edward took the cities of London and Oxford when his brother-in-law, Aethelred of Mercia, died. Edward’s sister retained control of the rest of Mercia and was known as the Lady of the Mercians. Edward constructed a burh (fort) at Hertford. The idea was to prevent the Danes moving south from Bedford and Cambridge. Edward stationed his army at Maldon and constructed a new burh at Witham to prevent the Danes moving west from Colchester. A second stronghold was constructed at Hertford making London relatively secure from attack. Edward’s sister Aethelflaed constructed a burh at Bridgforth to prevent the Danes crossing the River Severn. Edward succeeded in re-taking East Anglia from the Danes. Eadulf of Bamburgh died. He was succeeded by his son Ealdred. Bamburgh was an Anglo-Saxon stronghold in Northumbria and therefore important. Ealdred was on good terms with Edward. A Viking force from Brittany that tried to advance up the River Severn was defeated. Edward stationed a force on the south of the River Severn to deal with any further attempted attacks. In the Autumn the Vikings sailed to Ireland. Ealdred of Bamburgh was driven out of Bamburgh by Ragnall. This date is disputed and may have occurred as late as 918. Ealdred sought refuge with the Scottish King Constantine II. Edward built two burhs (forts) at Buckingham. He received the submission of many of the Danes of Bedford, Buckingham and Northampton. Edward built a new burh at Bedford. The Anglo Saxons were defeated by the Vikings. Edward built a fort at Maldon as a further check against advance by the Colchester Danes. The Danish Earl Thurcetel and his men left England and went to France. Edward’s daughter, Eadgifu, married Charles the Simple, King of the Franks. This date is disputed and may have been 918. Edward built a burh (fort) at Towcester to block any Southern advance by the Northampton Danes. A force of Vikings from Northampton and Leicester attempted to take the fort at Towcester but were successfully repelled. A force of East Anglian Danes constructed a fort at Tempsford and used it as a base from which to attack Bedford. They were unsuccessful and forced to retreat. The Anglo-Saxons defeated the Danes at Tempsford. The sole surviving Danish King of East Anglia was killed in the Battle. Edward defeated the Danes and took Colchester. The Danes retaliated by besieging the fort at Maldon but they were unsuccessful and many died. Edward received the submission of all the Danes south of the River Humber. This was a battle between Viking forces led by Ragnall and Constantine II of Scotland supported by Ealdred of Bamburgh. Although the battle was indecisive the Vikings suffered huge losses and only a quarter of their force survived. Aethelflaed’s daughter Aelfwynn was recognised as Lady of the Mercians. Edward the Elder was concerned that Mercia may seek independence and so removed Aelfwynn and took control of Mercia himself. Edward constructed a burh at Thelwell. The Viking, Ragnall, took York and proclaimed himself King of York. A daughter Eadburh was born to Edward and Eadgifu. The date of her birth is unknown. A daughter Eadgifu was born to Edward and Eadgifu. The date of her birth is unknown. A son Edmund was born to Edward and Eadgifu. A son Eadred was born to Edward and Eadgifu. The Scottish King Constantine II submitted to Edward. Edward died leading the army against a Welsh-Mercian rebellion.